This was a very important finding, many thanks! Maybe the common output stage is causing the crosstalk: if the unused outputs are open, they do not load the output driver. Two ideas came to my mind. Could we use the outputs as high-impedance ones? Would it be possible to improve VDDO bypassing, do you see the output signal(s) there? I found a strange behavior when tuning the Si5351 above 118.4 MHz. Up from that frequency the ouput signal is verry noisy caused by strong jitter (I think). I found that it has to do with the Multisync deviders. When the devider is an integer, no problem but when its an fraction like 7.55 then the jitter started. Also no problem when it’s 7.5 (by example). 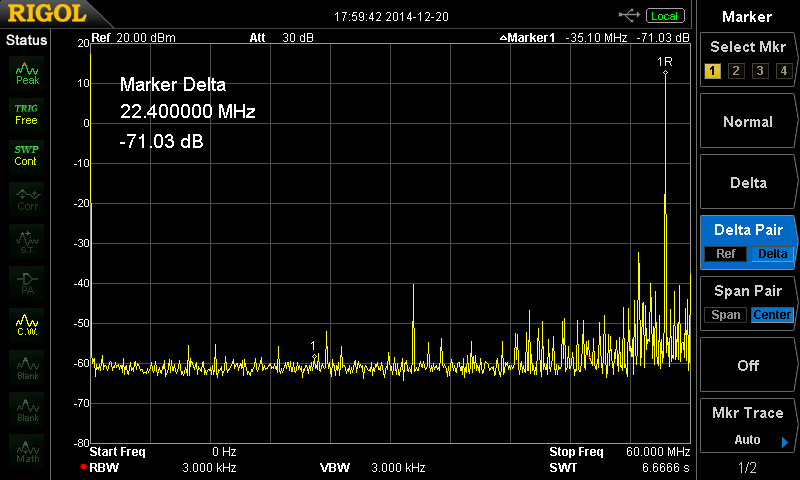 I’m using a 25 MHz x-tal and set the PLLA fixed to 900 MHz. I found this problem with different software drivers for the Si5351. Did you regognized this problem and if so is there a solution for this jitter? Then try your test again to see if you still have the same issue. Thanks for the updated library. It took some time because I had to port it to the PSoC development envirement but it’s working great now! When I used it the first time, I found that the set frequency must be multiplied by 100 for getting the right output frequency… But I’m happy that it’s working now. After I switch off and switched it on again, the same jitter problem was back above 118 MHz…. Until now I did not get the device jitter free running. It seems that if one of the registers has a wrong value, it stays wrong…. I also found that on clk1 and clk2 there is a steady signal of 112.3892 MHz, even though it was not set. Well a lot of strange behavior which I can’t explain. Maybe you have a suggestion? 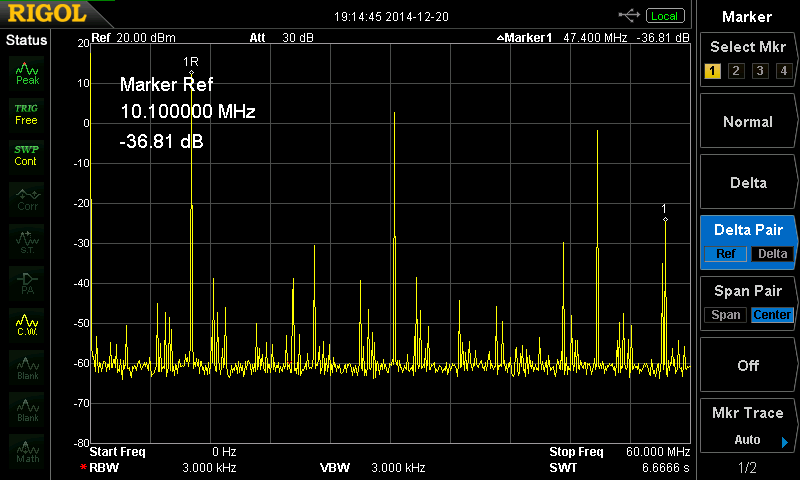 Well I found that everything is working fine when I set in the Set_freq not PLL_FIXED but 0ULL…. So the problem is in the PLL fixed frequency setting. But by now, it’s working again and no jitter above 188MHz. In fixed mode it’s not allowed to use a divider value less than 8. And that caused the problem. In the calculation of the divider value to get an output of 120 MHz the divider value is 900/120=7,5 (is = 960 MHz, which means at a X-tal frequency of 27 MHz (which I’m using): 27 x 36 = 972 MHz. 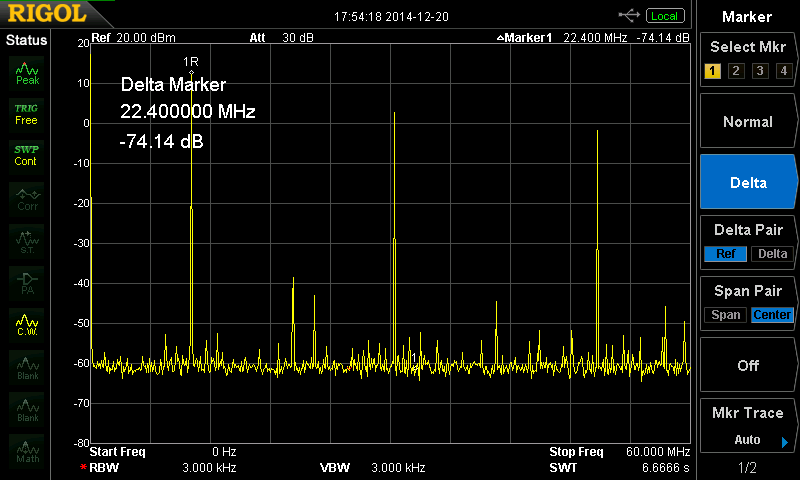 At 25 MHz it should be 120 * 8 >= 960 MHz, which means 25 * 40 = 1000 MHz for the fixed VCO frequency. I tested above with a 27 MHz x-tal frequency and it was working OK. A nice clean signal on 120 MHz. If you changed the .H file for this new PLL_FIXED value don’t forget to change the PLL_VCO_MAX frequency as well! Sorry there was missing a part of my story… Try it again. In the calculation of the divider value to get an output of 120 MHz the divider value is 900/120=7,5 (is smaller than 8). The solution is to increase the fixed value of the VCO to 120 * 8 >= 960 MHz, which means at a X-tal frequency of 27 MHz (which I’m using): 27 x 36 = 972 MHz. At 25 MHz it should be 120 * 8 >= 960 MHz, which means 25 * 40 = 1000 MHz for the fixed VCO frequency. OK Rob, I understand the confusion now. The PLL_FIXED value probably should be changed or removed, as it is only a suggestion. You can pick any PLL value between 600 and 900 MHz. So in your case, don’t use PLL_FIXED, use a lower PLL frequency such as 600 MHz. That way the code can use a divider of 6 or 7. I just checked this with the latest library, by setting a PLL frequency of 600 MHz and requesting a 155 MHz clock, which worked just fine. I’ll add some notes about this condition in the documentation. Thank you for bringing it to my attention! I can’t find where you describe your hardware setup used for this experiment. Currently I am finding little evidence or crosstalk issues internal to the Si5351, but I am finding that the device is susceptible to intermodulation when there is crosstalk between the clock lines external to the Si5351. The intermodulation issue increases dramatically when higher Si5351 drive levels are used – at least in my test setup. But when external coupling between the clock lines is removed, product frequencies become undetectable – at least not detectable using the crude test methods I have at my disposal. So I am interested to learn if there might have been subtle avenues for external crosstalk in your test setup. Even a few pF between the clock lines seems to be significant. I am hoping that decoupling resistors in the clock transmission lines (as described in the Si5351 data sheet) will improve the intermodulation performance. Were such resistors used in your test setup?